Maldon sea salt flakes from the U. K.
This is a cookie update. A little while back I shared a recipe courtesy of my sweet neighbor Trish Bock. 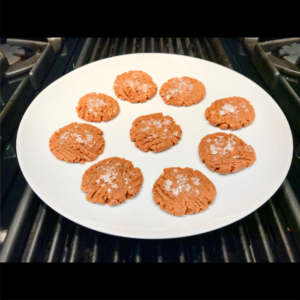 Over time I have come to bake a slightly different recipe and I wanted to share it with you so you can know what’s happening in my kitchen. By the way, I bake these cookies a lot! Everyone loves them because they are flourless – yes gluten free – no butter either and they are soft and delicious! First, make sure when you shop the shelf at your local market, you read the ingredients. Look for a jar of peanut butter without any additives, preferably unsalted. 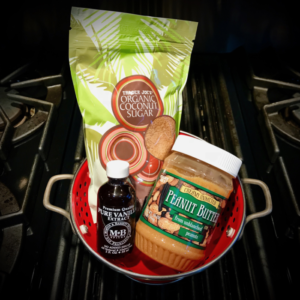 You just want “dry roasted peanuts.” From time to time I encounter my only option when choosing a peanut butter without any other additives is to end up with the ingredients: salt and peanuts. That’s okay. It still tastes really delicious. Trish’s original recipe was to add salt to the cookie dough I just prefer it with unsalted peanut butter. 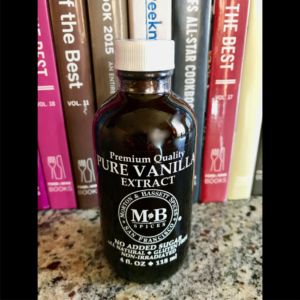 Try to find Pure Vanilla Extract with no corn syrup or added sugar. The brand I buy contains only water, alcohol, and vanilla bean extractions. I even buy organic range free eggs. Next, take one cup of coconut sugar and place into a bowl with the peanut butter. Beat the egg with a fork before adding it to the bowl. Make sure your egg and your peanut butter are room temperature. If the peanut butter separated and there is peanut oil at the top of the jar stir it up before measuring your 1 cup of peanut butter. Add the vanilla extract to your bowl of ingredients and mix well, and make sure you mix it well. Once it is mixed the consistency changes to the dough and it will be easy to shape them into cookies. Preheat your over to 350 degrees. 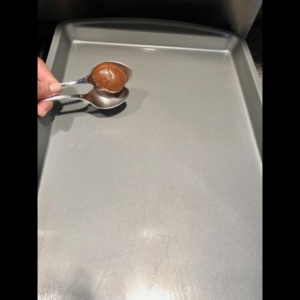 Grease the cookie sheet with coconut oil spray, make sure it is spread evenly. Take two fresh teaspoons and use them to make little round balls of dough. Keep them little, not too big. If you make them too big then your cookies spread out when you bake them and they bake into each other and then you have one giant cookie. So, make them nice and round and petite. Take a fork and press down on the tops of the cookies in the pattern of a grid, make sure they are slightly spread out so they don’t touch when they bake. 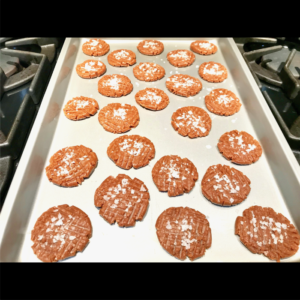 Sprinkle the cookies with Maldon Sea Salt Flakes. I’m so glad my neighbor Trish turned me on to the sea salt flakes, thank you, Trish! I’m a fan. It’s funny. People automatically think these cookies are topped with sugar, but they seem pleasantly surprised to find out it’s actually salt. Bake your cookies for 8 minutes on 350 degrees. Once the timer hits 8 minutes pull them out of the oven immediately. Let them cool before serving. 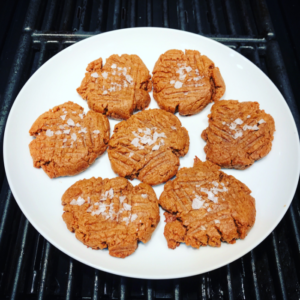 Gluten-free, butter free, flourless, easy bake, homemade, peanut butter cookies, coconut sugar, dessert.